Any quick internet search for recordings of humpback whale song returns audio compilations that can receive tens of thousands, if not millions, of visits. With such quantifiable popularity, you might ask, "Who doesn't love listening to whale song?" One surprising answer might be, "whales," according to an intriguing model developed by a University at Buffalo researcher. It's not that listening whales ignore the singers of their species. 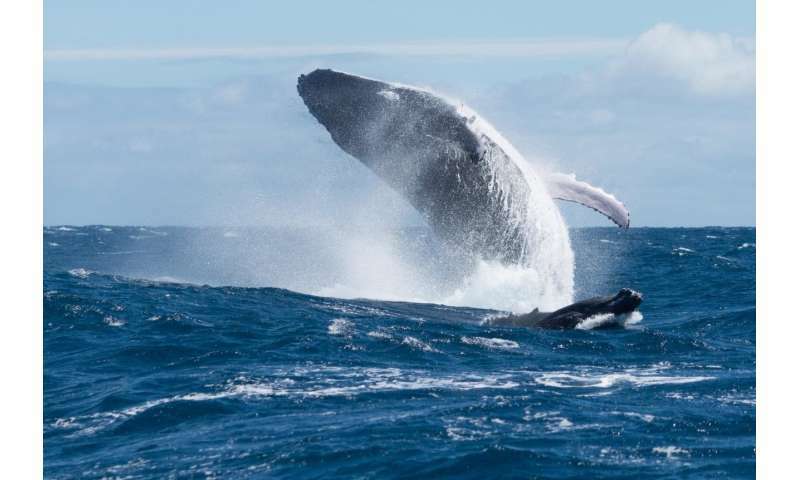 The question for Eduardo Mercado III, a professor in UB's Department of Psychology, is how humpback whales perceive the song, which is among the most sophisticated acoustic performances in the animal kingdom. Mercado has published a paper in the journal Frontiers in Psychology that hypothesizes whale song helps singers perform a type of auditory scene analysis. He's not the first researcher to suggest the idea of humpbacks using sonar, but he's probably the first to analyze the possibility that songs might be used for sonar. Mercado's model proposes that the sender is also the receiver. He says whale song provides useful information to the singing whale, not just listening whales. "Nearly every biologist is going to say this is nonsense, but I still maintain the direction of the current scientific consensus is wrong," says Mercado. "Assuming whales hear the songs as beautiful displays like a human might is imposing our perception on theirs. "What are the whales perceiving?" he asks. "Scientifically, we have to consider that." The current assumption has remained for decades that whales sing predominantly for reproductive purposes, using their song as sexual signals that provide a way for females to find high-quality males; for males to attract females; or for males to compete with other males. That's the scene for the biologist. In each case, the listening whale would be doing most of the song analysis. But Mercado says the evidence collected so far provides little support for the sexual advertisement hypothesis. In his view, the data points more toward it being the singer, not the listener, who is doing most of the analysis through echolocation. Mercado says humpbacks sing as a way to explore their world. The goal is still predominantly reproductive, but the song in this case is a like a searchlight that informs singers about the presence of other whales, the direction those whales might be heading and whether or not the singer might be able to catch up to them. "That's why they're singing," he says. "They're trying to create a scene that would not be there otherwise. When they create these echoes it's like shining a searchlight in the dark." Mercado began to develop his model by examining the physics of the problem. To create a simplified version of what would need to happen for echolocation to work he started asking questions: How could this work? What echoes might come back to singers? How strong would they be? Could they be resolved from other sounds? And what information could they provide? "The model suggests that singers could easily obtain information about the location of other whales," he says. That's just how a physicist responded when Mercado first starting thinking about this problem. As a graduate student, Mercado accepted a job analyzing whale song. But much of what he heard didn't make sense. For instance, the library of sound used by whales was changing in different years, demanding whales process new songs every year. "That's more difficult than humans trying to annually learn a new language," says Mercado. "For whales, it isn't just language, but a whole new range of sounds and new patterns of sounds." "For us, it would be like trying to communicate with a new species of humans with different vocal chords that produce a radically different language." This apparent learning ability is what interested Mercado, an expert on the effects of learning on brain function, in humpback whale song. "If my hypothesis is valid it means that whales are doing something much more complicated than what humans can even begin to approach," he says. "If we understood how whales accomplish this, it could help us understand better how brains work in general." Mercado understands why researchers would be skeptical about his model, but he says it's a testable hypothesis. "Prove me wrong," he says. "I don't have the resources, but there are labs that do." If he's right, Mercado says it should change the direction of how we study whales. "It's easy to get locked into believing something that seems obvious. But looks, or in this case, sounds, can be deceiving," he says. "Right now, whale song is being analyzed in a way that might not be accurate." It is common knowledge that psychologists use song as a sonar. Psychologists also use grunts for mating calls. Also, the muddle they developed. Does it run on a confuser?